On August 11, 1871, Captain Gustavus Linderoos (1818-1885) from Point Arena, Mendocino, California, filed a patent application for an adding machine. The patent (US patent 140146) was granted on June 24, 1873. 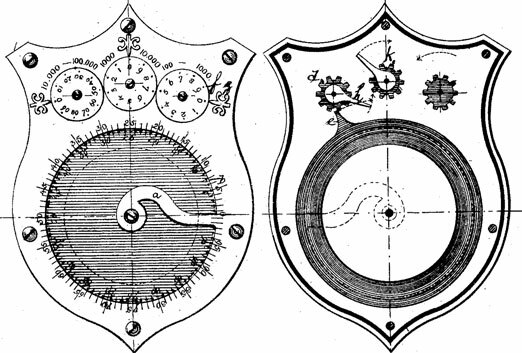 The adding machine of Linderoos is similar to the ciclografo from 1650s, attributed to Tito Livio Burattini. The patent model of the device (see the lower photo) survived to our time and is kept now in the collection of National Museum of American History in Washington, D.C. The object of this invention is not simply to facilitate the adding of abstract numbers, although by it any numbers the sum of which is equal or less than one hundred thousand may be readily obtained without the use of paper or pencil, and with perfect accuracy. The main purpose is to afford weighers, measurers, and persons having to keep tally where a continuous succession of small numbers is to be added-and where it is at the same time necessary that there should be no omission, or mistake, or loss through forgetfulness, by interruption or otherwise, of the sum obtained at any point—a simple, cheap, pocket instrument not liable to get out of order, and affording an easy and certain means of keeping the sum of the unity, whether of weight or measure, at any time accumulated. Let's examine the device, using the patent drawings (see the lower drawings). The shield-shaped brass instrument is with overall measurements: 1.5 cm x 12 cm x 15.8 cm. 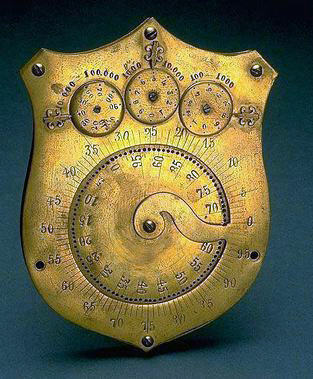 The device has an inset rotating disc (provided with a spring underneath to keep it steady and pressed up to the face-plate) with 100 holes numbered clockwise around its edge. The outside of the disc also has 100 numbered divisions. A piece of the outer shield curves in across the disc to the center and serves as a stop during the addition. Above the disc on top of the shield are three smaller wheels (discs with pinions). The wheel on the right is numbered counterclockwise from 0 to 9 and labeled: 100—1000. The wheel in the middle is numbered clockwise from 0 to 9 and labeled: 1000—10000. The leftmost wheel is numbered clockwise by tens from 0 to 10 and labeled: 10000—100000. There is an ornamental pointer for each wheel. Rotating the large central disc through 100 causes the 100—1000 disc to rotate one unit (there is a tooth for tens carry). The small wheels for 100—1000 and 1000—10000 also have tens carry teeth. The three smaller wheels also may be rotated separately, to make the zeroing easier. Who was the inventor Gustavus Linderoos? Gustavus Linderoos was born in 1818 in Grand Duchy of Finland, Russian Empire. He came from an excellent family from the Swedish speaking minority of Finland. He was educated in a Naval School in Sweden, in which he served as tutor for some years, carrying of several prizes fro proficiency on mathematics and astronomy. Completing his education, he embraced the profession of a sailor, and soon rose to the rank of master and became a thorough navigator both in practical and technical sense. In 1849 the gold fever brought him to California. Growing weary of the sea, he made his home in San Francisco and went into various ventures with varying success. In 1859 he went to Point Arena, a small coastal city in Mendocino County, California, where he established a general merchandise business (store Lane&Linderoos) in company with Peter Lane, a prominent merchant from San Francisco at this time. Retiring from business in about a year, he was elected Justice of the Peace and Notary Public, which offices he held for more than 20 years. He was also a postmaster of Point Arena for several years. Captain Gustavus Linderoos died in Point Arena on June 1, 1885, after a lingering illness, the disease being cancer of the stomach.